A widespread (EOO 164 885 km²) and still relatively common species in spite of extensive habitat loss and degradation across its range. It is however not yet considered to be in danger of extinction. 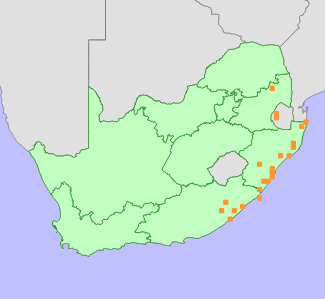 Widespread across eastern South Africa, from near Graskop in Mpumalanga to Kei Mouth in the Eastern Cape. It also occurs in Swaziland. Margins of riparian bush in grassland, forest margins, sometimes in swampy habitat. This species is threatened in places by habitat loss and degradation. Around Durban and on the KwaZulu-Natal south coast, some subpopulations known through historical records may now be locally extinct due to habitat loss to urban and coastal development. Coastal grasslands across KwaZulu-Natal have been extensively converted to sugarcane and timber plantations, but since this species grows along the edges of deep ravines and in scrub along drainage lines, it may have been less impacted by these threats, which affect mainly open grasslands. Riverine habitat is often densely infested with alien invasive plants, and some recent field observations indicate alien invasive plants present in the habitat of some subpopulations. Dioscorea species have known medicinal properties, and many species are collected for traditional medicine. Little is however known about the impact of medicinal harvesting on this species. This species is known from a large number of records scattered over a wide area. Although it is somewhat localized to suitable habitat, notes on collected specimens indicate that it can be locally common. Although it is threatened in places by habitat loss and degradation, it is still common and not yet in danger of extinction. Wilkin, P. and Muasya, A.M. 2015. Clarifying the Dioscorea buchananii Benth. species complex: a new potentially extinct subspecies for South Africa. PhytoKeys 48:51-72.